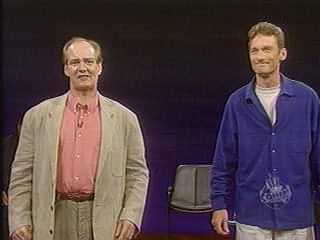 Whose Line is it Anyway? (WLiiA?) is a show in which contestants improvise scenes in theatresports-type games given to them by the host. They might be asked to sing about an audience member, speak only in questions, become weird superheroes, or guess at bizarre quirks. The show is a Hat Trick production which began life as a 'competitive' team game on Radio 4 in the UK. Host Clive Anderson was joined by four contestants, including regular team captains John Sessions and Stephen Fry. Colin Sell provided the improvised music. After a year, the series moved to television and Channel 4. Clive continued to host, with John initially appearing in every episode, and Richard Vranch providing music. The competitive format was dropped but mysterious "points" were still awarded and a seemingly random winner selected. Common performers on the show included Greg Proops, Josie Lawrence, Brad Sherwood, Paul Merton, Sandi Toksvig, Mike McShane, Chip Esten, Jim Sweeney, Steve Steen, Tony Slattery and Steve Frost, as well as Ryan Stiles and Colin Mochrie who became fixtures of the later seasons. These performers were joined by guests such as Stephen Fry, Rory Bremner, Graeme Garden, Jonathan Pryce, Ardal O'Hanlon, Mark Cohen, George Wendt and many more. A number of episodes were filmed in New York in 1991/92. In 1998 the original show celebrated its 10th year by filming the series "In Hollywood". The cast then joined a new host, Drew Carey, to tape a 6-episode pilot series for ABC with Ryan & Drew as producers. Laura Hall provided music for both of these series. The pilot run was successful, extended by an extra episode followed by a full series shown in a summer replacement slot. The US version, sometimes referred to by fans as DLiiA? (or "Drew's Line") has seen Wayne Brady join Ryan & Colin as regulars. Fourth-seaters have included the return of oldies Greg, Josie, Chip & Brad as well as newcomers including Kathy Greenwood, Denny Siegel and Jeff Davis. Laura has been joined by guitarist Linda Taylor and other musicians. Robin Williams, Whoopi Goldberg and Stephen Colbert have appeared for episodes, whilst celebrities including Jerry Springer, Florence Henderson, Sid Caesar, Hugh Hefner, Richard Simmons, Chyna and even Lassie have joined for individual games. Whilst tapings finished in 2003, new episodes from existing tapings continued on ABC and ABC Family until 2007. The US cast continued to perform improv together in live shows, with the Improv All-Stars touring regularly and broadcast as a TV special. The stage game format was adopted for Drew Carey's Improv-A-Ganza on GSN in 2011. 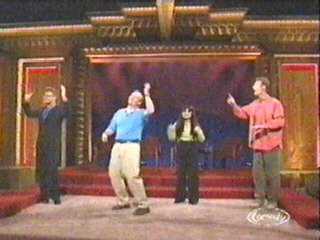 Improv games were also combined with animation in Drew Carey's Green Screen Show on the WB in 2004. In 2013, Whose Line was revived on television by The CW with Aisha Tyler as the new host. The three regulars have returned along with some past players, and new performers including Gary Anthony Williams, Heather Anne Campbell, Keegan-Michael Kay, Jonathan Mangum and Nyima Funk. The celebrity guest format has become a regular feature in the majority of episodes. The show has been renewed for further seasons.